New Wave Domesticity: $5 meals! 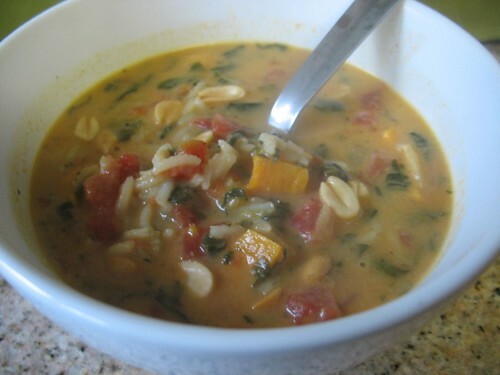 african peanut stew! i decided i would like to work on my grocery shopping and challenge myself to be better at keeping track and making my meals a little more economical. i would like to try to be proactive about sharing some $5 or less meals that i enjoy. some of them might be a little lack luster and not very glamorous looking, but they are good and filling and really work in an everyday situation when you are working with budget and also working with time constraints of working full time. not boring, but just simple. sometimes i find those really easy everyday kind of ideas helpful and i hope you will too! last night, i tried something sort of different and i really loved the way it turned out. i love soup. i think it is such a wonderful versatile meal and i love that it is easy to store and freeze, but i felt a need to try something different from my normal path. this peanut stew was inspired by my favorite soup at a local pub and it turned out really wonderful, it is really hearty and it is actually not too overwhelmingly peanutty. it also heated up super well the next day for lunch...it was maybe even better the second time around. 1. in a large pot, sauté onion and garlic in sesame oil until translucent. down to medium low, cover and simmer for 10 minutes. 3. stir in peanut butter and milk. if you are using frozen spinach, add it now...if you are using fresh, wait a few moments to add so it doesn't get overcooked. bring to gentle simmer and cook uncovered for 5 minutes. 4. if you are using fresh spinach, add in and cook until wilted, 2 to 3 minutes. remove from heat. 5. ladle stew into bowls and top with peanuts and green onion or cilantro, if desired. i found that this recipe as is was really thick, so you might want to add more liquid. 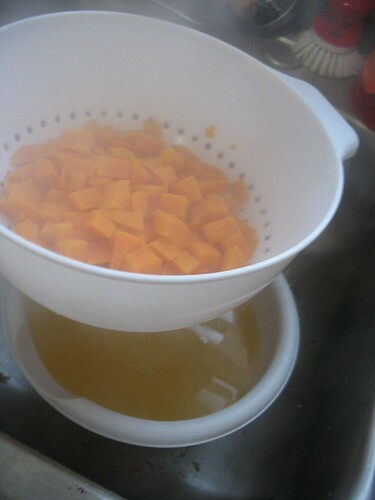 i did that by using the starchy sweet potato water left over from the next recipe (about 2 cups), but you could also use more stock or milk or water. the egg white thing was more a mess than it was worth and i had a hard time getting my patties to get too solid but that could have been because i did not chill them long enough or because i used an emulsion blender to mash the potatoes which perhaps mashed them too well. but these were just sweet little nuggets that took little effort to prepare, so it was a nice use of left over sweet potato. also, make sure you use just white bread crumbs for this...no fancy herbed stuff because it is a sweeter kind of dish. these turned out just fine, nothing fancy but a good little side that was a little different than just a pile of mashed sweet potatoes!